Fun Workshop with Monika Jones and new Finishing Technique! It was another fun workshop for Wine Country Rug Hookers, an ATHA chapter in Northern California! We are quite active in bringing in teachers to expand our knowledge and expertise! Monika Jones is known for her beautiful old fashioned rugs and textured wools; she is also a lovely and attentive teacher. 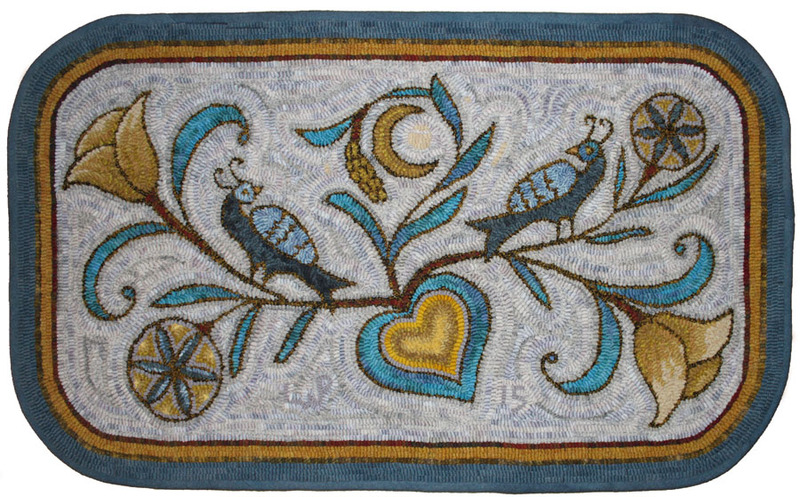 Monika recently finished this rug for her Arizona kitchen. Yes, she uses her rugs on the floor in the kitchen and washes them as needed. I love the changes in the background on this rug; in the old days when folks used scraps to hook rugs, they almost always ran out of one colour or another. 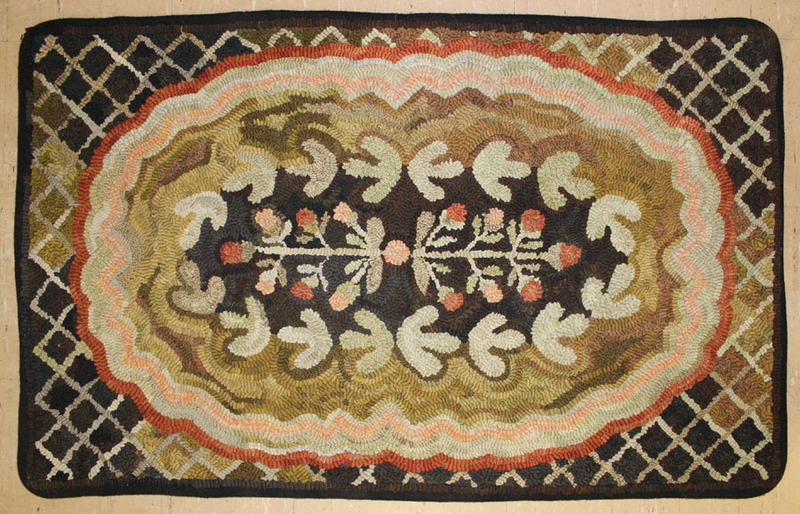 This rug has various backgrounds in the old fashioned way. 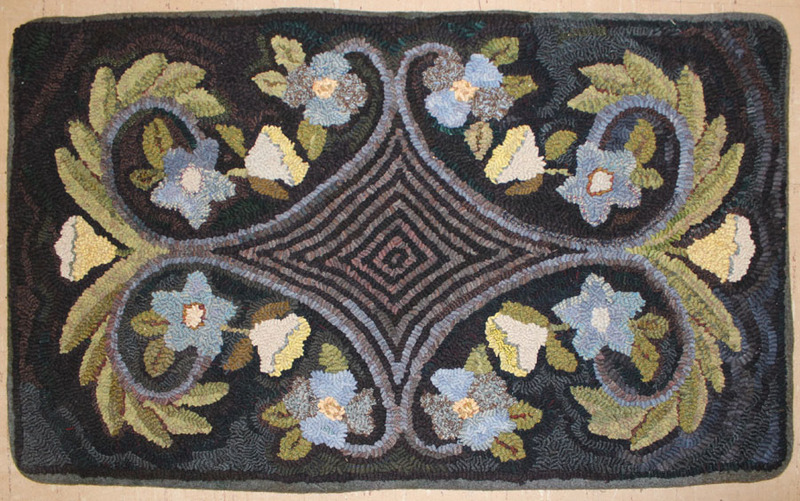 The simple colour scheme in this rug is so pleases me; yellow, green, blue with a tinge of red violet, an analogus colour plan with an antique black background; an old fashioned variety of blacks. If you look closely, you can see the loops in the center are very large cut… perhaps as much as 1/2 inch. Delightful! All of Monika’s rugs have a beautiful edge; biased wool plaids that compliment the rest of the rug. Monika showed us how she creates the biased wool strips, irons one side and sews it to the edge of the hooking. She uses a ‘ladder stitch’ to keep the strip close to the hooking. Watching her demonstration, I knew I was finally ready to try this finishing technique! This is one of my Fraktur patterns and I thought it would be suitable for this workshop. I decided to use a simple colour palette; one of my favourites, blue and gold! Another ‘Outline & Fill’ project for me… I just love outlining with a plaid and letting it take me on a ‘Colour’ adventure. By the end of workshop, i had picked my colours and wools. My background would be light grey… dangerously dull… to tone down the YELLOW and BRIGHT BLUE! Monika’s hand-dyed wools were all textures and laid out on the table behind me. The yellow wools started calling my name almost immediately, so I bought several along with a grey plaid and an orange red plaid. By the time I figured out my colour plan, the rest of Monika’s grey wools had all been purchased, so I used a couple of spot dyed greys from my studio wools. The stack of wool on the left are the wools bought from Monika, the middle stack is the background grey wools I dyed, and the stack of wool on the right is the wool I came with… that worked. This project was so fun, I hooked it in a couple of weeks. It took another couple of weeks to get the bias wool tape prepared! I dyed several pieces of wool including some plaids and selected a piece that was a little heavy for hooking. With my rotary cutter, I cut 2″ strips on the bias, then sewed the strips together, ironed the seams and one edge folded. At this point, I was hoping it was all going to be worthwhile! When I had the blue bias wool tape made, I laid it around the rug to make sure it was long enough. I liked the 1 1/2″ edge of blue, so I realized I would have to add 3 more rows of hooking with the same blue, because the bias wool edge would only show about a 1/2 inch. I brought the project to the May chapter meeting and Nancy Bailey was able to describe the ‘Ladder Stitch’ technique to me. It works quite well getting the edge tight to the hooking. After I completely stitched the wool bias tape to rug, I trimmed the linen to just a little inside the width of the tape. I knew folding them both over, the inside layer would be longer; the linen wanted to be enclosed by the wool. With the rounded corners of the rug, everything eased in beautifully! After a good pressing, ‘Fraktur Blessings’ is done and has a great finished edge! 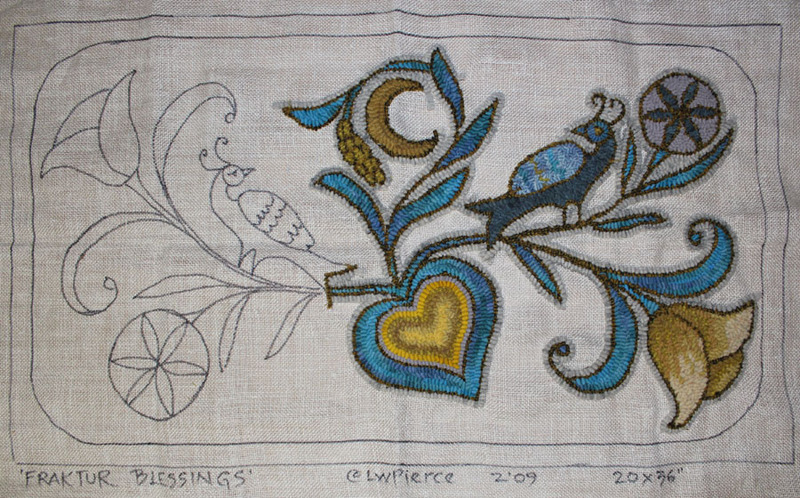 ‘Fraktur Blessings’ is available in my Flying Dog Hookery Catalog of Patterns; 20×36″ on linen, $65. Now that I’ve hooked it up, I can tell you how much wool you’d need, or kit it up with similar wool. 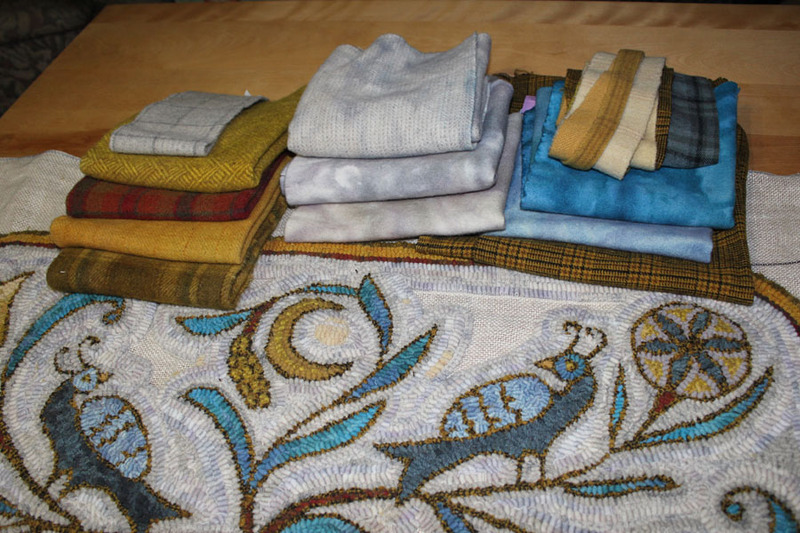 « Just a few more Rockaway Rugs – 2015! 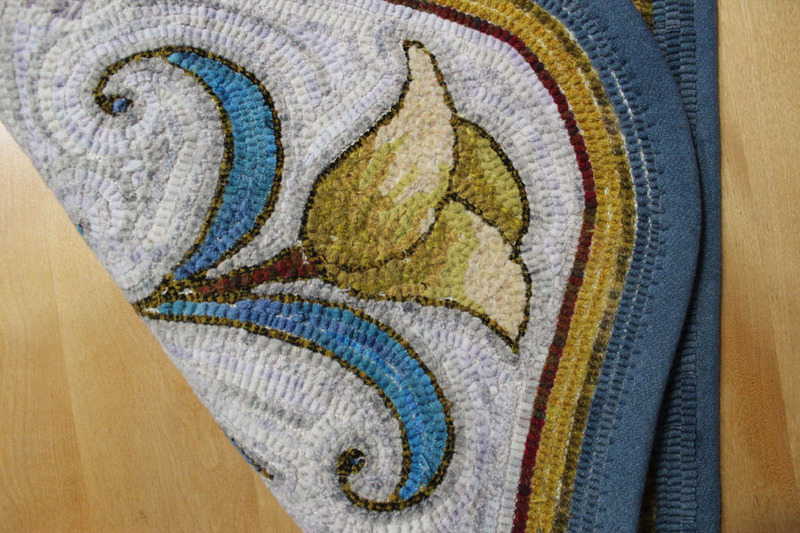 glad I’ve learned how to do this finishing technique… i think it’s perfect for a floor rug. 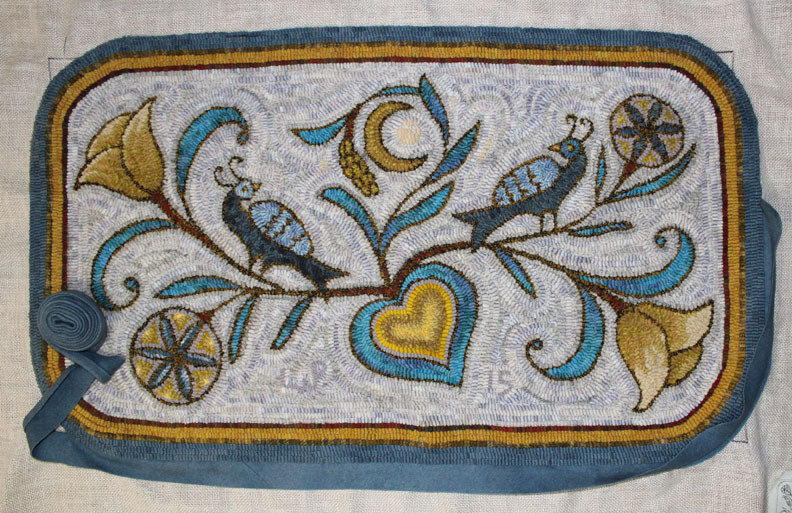 thanks for your kind comments on my Fraktur Blessings! The pattern is 20×36″ and costs $65, plus tax and shipping. I will have to look at my notes and get back to you in regards to the full kit. I am just back from the ATHA Biennial and have a bit more unpacking and bookwork to do, but will follow up with more information privately via your email.